Hong Kong is a beautiful paradox; how can the land that never sleeps be the island of dreams? Oh, but it is, as I discovered last month. Apart from requiring the stamina of a Himalayan Sherpa, experiencing Hong Kong in all its guises is a bucket list must. From relaxing in the world’s most frequented Four Seasons spa to slumming it on the Star Ferry, and from climbing myriad rooftop bars to imprint the picturesque skyline on your memory to dining night after night on exceptional gastronomy, there simply isn’t ever enough time to do everything that needs to be done in Hong Kong. One adventure that surely cannot be missed, however, is a visit to the 250 outlying islands (perhaps not all in one go). It makes for a fantastic alternative to an island hopping superyacht charter trip – just take a look at my latest write up in Robb Report to get tips on how to do it right. I simply adore the LEGO front cover of Northrop & Johnson’s spring issue of Navigator. It’s taking all of my adult self-restraint to not break open my children’s LEGO box and start building. Such a simple, yet clever way of creating an eye-catching cover that gets its readers’ artistic juices flowing before they’ve even turned a page. Navigator, I applaud you. Hailed as one of the most hospitable and friendly nations in the Gulf, Oman boasts 1,700km of pristine coastline, vast tracts of desert, mountainous ranges, prehistoric wildlife, rolling sand dunes and Arabian culture, not to mention the odd cricket pitch or two. Adding to this incredible roster is the latest in luxury developments, Barr Al Jissah. Located just 20 minutes from the cosmopolitan capital city of Muscat, its history dates back as far as 2,000BC when it was accessible only by boat and thus created a rich heritage as a maritime trading post. Today it has transformed itself into the French Riviera of the Middle East. Nestled in the secluded coves and peaceful waters that serve as a natural sanctuary for endangered hawksbill and green turtles lies a stunning new development offering waterfront living, a members-only beach club and an exclusive deep water marina. With its world-class facilities already attracting the attention of elegant yachts and ethereal catamarans, who better to have designed the interiors of Barr Al Jissah’s striking Limited Edition Townhomes than London-based, award-winning superyacht design studio, Bannenberg & Rowell. Read this feature in full in the next issue of Simply Abu Dhabi magazine. 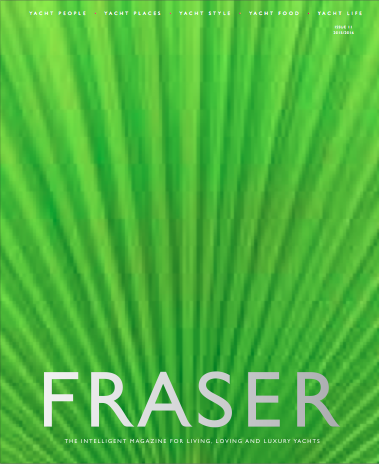 So for those of you who didn’t view it in the flesh at the Monaco Yacht Show last week, the latest issue of Fraser – the beautiful luxury publication for superyacht brokerage house Fraser Yachts – has finally landed. It was a fantastic magazine to work on as commissioning editor, and we’re already putting our heads together for content ideas on the next issue. Here’s to keeping it fresh and glamorous in the world of yachting.